Halleron, a sophomore at Boy’s Latin, began his golf career at eight-years-old and by the time he reached 10, was competing in International Junior Golf Tour (IJGT) tournaments. 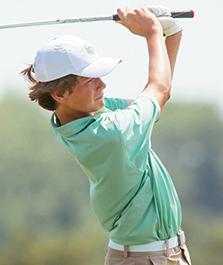 Heading into his freshman year on the golf team for Boy’s Latin, Halleron certainly made his name well known, capturing the individual golf title in his first appearance at the Maryland Interscholastic Athletic Association (MIAA) Individual Strokeplay Championships. Halleron shot two under par and secured a two-stroke lead going into the final round where he shot a 70, three under par for a combined two-round total of 139. While Halleron was an individual champion, the Boy’s Latin golf team had an undefeated season, resulting in MIAA B Conference Champions. In order to continuing excelling in his athletic career, Halleron spends six to seven days a week during the summer practicing/playing golf while also working with his swing coach, Pat Coyner, a few days a week. During the high school season, he’ll practice five days a week after school. While Halleron spends most of his free time involved with golf, he admits that academics come first. Entering into his sophomore season, Halleron would like to capture another Boy’s Latin team conference championship and work on his swing to prepare for a full schedule come spring. And although he still has two years left at the high school level, Halleron has his eyes set on competing at the highest collegiate level possible and potentially reaching a professional level in the future. Even though the high school season kicks off in the spring, Halleron continues to compete competitively throughout the year through American Junior Golf Association (AJGA) tournaments. Nominate a local athlete! Please email your nominations to C eese@whatsupmag.com.